Catalogs are the easiest way to keep track of the products you discover and want to remember. Gifts: items you are considering purchasing for a friend or family member. Create one for each person! Control who sees your catalog on Shop Your Way. Public. Catalog will be visible to all Shop Your Way visitors. Friends. Catalog will be visible only to Shop Your Way users that follow you and who you follow in return. Private. Catalog will only be visible to you. You can always change the catalog's privacy setting by clicking "Settings" in the catalog page. If you are having trouble choosing a gift for someone, Shop Your Way can help by making the decision easier. By creating a Choose a Gift catalog and adding your friends as “editors,” you and your friends can generate gift ideas that are easily accessible to see and share. You can then vote on the best idea using the “like” button next to each option. The catalog is by default set to “private” mode so that you will be able to choose who can see the catalog. We also have an app for helping to choose gifts called Presentip. Catalogs Leaderboard shows the top 100 catalogs that the Shop Your Way community thinks are the most interesting and engaging. Creating a catalog is a great way to keep track of items and products on Shop Your Way. With the visual catalog tool, you can give your catalog a visual context with a personal touch. The Visual Catalog is also interactive and a great way to express your creative side. 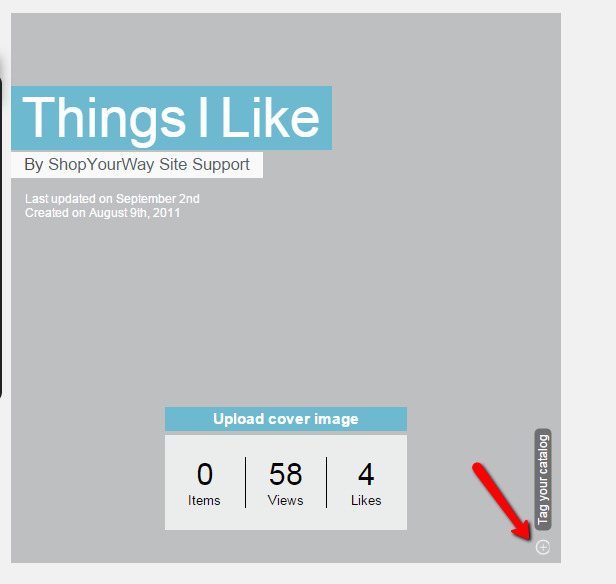 It’s a cover image that lets you tag the items from your catalog on the image itself. To upload a cover image to a catalog, go to the catalog’s page and click “Upload a Cover Image” under the catalog’s icon next to the catalog name. You will then be prompted to upload an image. Click the orange “Upload” button in the center, and choose an image file to set the cover image. The image must be a PNG, JPG, JPEG, or GIF file, and for best results, should be 1200px wide by 540px high. 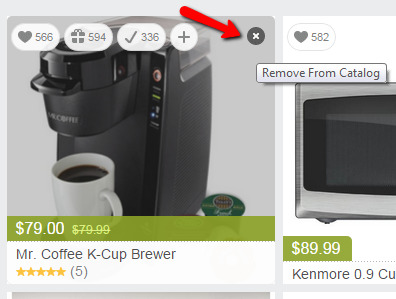 You will then be prompted to tag items from your catalog on the image. To do this, click anywhere on the cover image, and then select an item in the pop-up list that’s in your catalog. You can tag as many items as you like. When you are done tagging, click “Done Tagging.” At any time you can tag more items, remove tagged items, replace the image, or remove the image. The choice is up to you! You may also tag your catalog by going to the catalog setting page and click on "Catalog Tags"